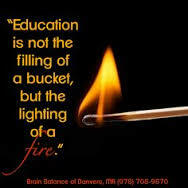 My teaching philosophy is that education is not about filling buckets but lighting fires. What does this mean really ? Here are two (rather extreme) examples of observations and suggestions on my course Empirical Methods for Finance taught in the third year of our first degree in International Economics and Finance. STUDENT A: Horrible. Incomprehensible. Useless. The professor has serious difficulties in explaining the material. This is further exasperated by his attitude. When asking students in class whether they understand or not and only one or two students raise their hands, the professor's conclusion is dead simple: "Well if two people understand that, everyone in the classroom can". I am afraid that is not the inference to make here. In fact, the more reasonable inference is quite as simple but substantially different: the professor is incompetent in explaining the notions of his course. The guidance for writing the report in non-existent. If the aim of this course is to show that hard work is underrated and non-scientific guessing is what counts, then this course is a tremendous success. Dear professor, I hope that you remember this piece of feedback when you sit alone in your office during your office hours and keep wondering why no students come. STUDENT B: The best course I've attended so far. It actually thought me something instead of just forcing some notions into my head that I would have forgotten in two weeks. The teacher is more than competent and very human, I'm just sorry not everyone appreciated the opportunity they had just because they're not used to stop and start using their brain anymore. Here is my reflection: if half of the students in my class agrees with A and the other half agrees with B, then my teaching evaluation would be horrible and I could be removed by the responsibility of the course because of low customer satisfaction. Is this really right ?